We are approaching April Fool’s Day, which brings us one step closer to spring on the East Coast. Yet, even in April, it can be very blustery. I recall a party we had in April, 1995. Everyone came in springy clothes and we were having great fun on the screened in porch. But then, the wind came up. The wearers of madras pants and shirts, shorts and Hawaiian shirts were all driven indoors by the wintry gusts. On the East Coast, I have enjoyed seeing the Big Dipper and Orion, the Hunter. The experts say if you look straight up from the two stars at the end of the Big Dipper, you will see Polaris, the Polestar, which is also the first star in the handle of the Little Dipper. So far, a large locust tree has been blocking my view of Polaris but I hope to get a glimpse of this star, so important to navigators, soon. The Big and Little Dippers are also named, respectively, Ursa Major and Ursa Minor. The idea of two bears in the sky that do not hibernate and watch over all is reassuring. There are other constellations visible now. I have been using star charts in Robert Burnham’s Star Book to try to identify them but its slow going so far. There are also star charts available online. Mick is back in Ireland, capably mixing systematic research and wit in a study of what makes jokes work or not work. The results can be found in his book, Jokes, Quotes and Anecdotes . . . an Anatomy of Wit. 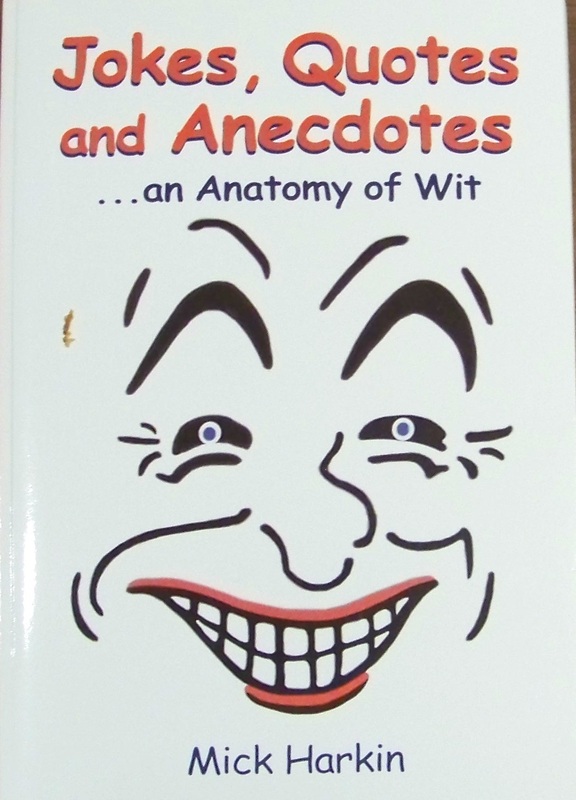 The book is available via Mick’s website and offers an overview of the history of jokes and how they are structured. The next 27 chapters consider specific joke types, such as those about lawyers, blondes and humor specific to several nations. 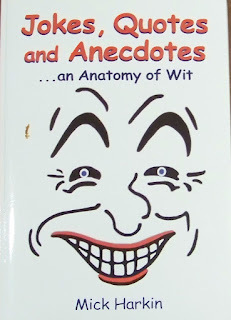 Each chapter opens with an overview of the anatomy of the jokes and then a selection of the jokes as examples - - and for the fun of it! Enjoy the night sky, enjoy April Fool’s Day and let’s hope you are enjoying some real spring wherever you are! If any of you have a good stunt for the day, please send it along and I will include it in post's comments. As spring approaches, so do opportunities to start trout fishing. In California, intrepid Pasadena Casting Club members have been catching trout in the Owens River, hard by the eastern Sierras. New York’s statewide trout season does not open until Friday April 1, 2016. But across the State, many catch and release opportunities are a comfortable drive from cities and suburbs. On March 2nd, I found myself at Ben Gray Pool, in a catch and release segment of the Beaverkill. Ed Van Put, the Catskill angling historian, advises that this pool was likely named after a nineteenth century river rafting captain. Ben Gray would take log rafts down the Beaverkill, to the East Branch of the Delaware, where small rafts were consolidated into larger ones and floated to Philadelphia. It’s nearly 200 river miles on the Delaware, from East Branch, New York to Philadelphia. If people could make money moving logs from this far away, it gives an idea of how quickly nineteenth century American cities were building up! Even though it was after work, enough sun was left to fish the Pool. But that was about the only thing the trip had going for it at this point. A stiff, cold wind dominated the pool. The wind speed was a step away from making whitecaps - - or enticing surfers in wet suits to catch a wave. With the wind, I lost interest in wading and decided to fish with roll casts from the bank. However, the reel had a thin leader from fall dry fly fishing and the leader would not separate from the fly line. After what seemed an eternity of fumbling with the whistling wind for a soundtrack, I decided to forget the leader change and tied a size 10 Woolly Bugger on a leader more suited to gin clear waters and size 20 flies. Then the roll cast fell apart as wind grabbed line at every step of the cast. With all these problems, the reader would figure the trip was a failure. However, on the second cast, a fish emphatically struck the Woolly Bugger. A minute later, I reeled in a 10 ½ inch rainbow trout. Wind, troubles with roll casting, and the arrival of dusk, chased me to the car. It would have been better to be prepared, to have double-checked the leader, or to have donned waders to get away from the brushy stream bank for more fluid casting and the chance to reach larger fish. These are great ideas for the next trip -- or the first trip in 2017. In the meantime, it’s great to keep replaying the experience of catching the first fish of the season.